Only 364 Days Until Next Yearâ€™s Stupid Caps! • Giancarlo Stanton, as he had promised, once again wore his flag-based arm sleeve last night. He had previously worn it on Memorial Day. • Someone on the Tigers — not sure who — wore creative socks during pregame warm-ups. Memo to MLB: Maybe you should think about sewing those patches on, instead of just using adhesive. Baseball News: Minor league teams wearing flag-based costumes yesterday included the Gwinnett Braves and Kalamazoo Growlers. … The Mets’ Frank Cashen memorial patch made its on-field debut last night. 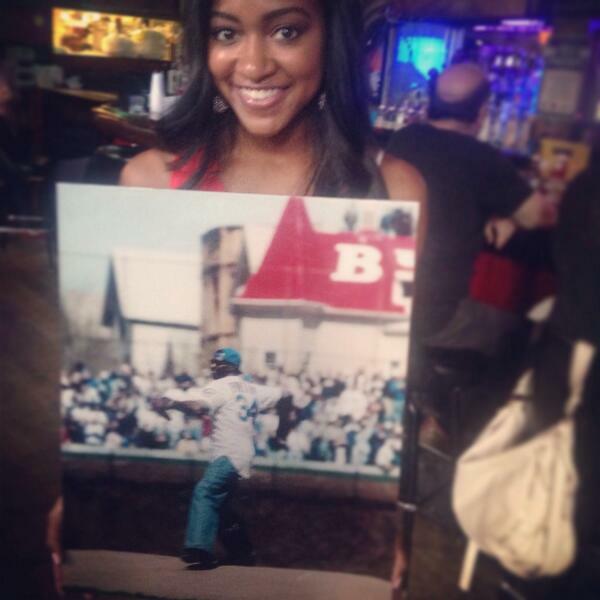 … Check this out: Walter Payton in a Cubs jersey (from Barry Brite). … For reasons that aren’t clear (at least to me), the Twins wore their road alternate at home on Thursday night. Have they been doing this all along and I just never noticed? … This is completely awesome: Baseball footage from the 1956 Olympics, where baseball was a demo sport. Look at those uniforms!! (Tremendous find from Cort McMurray.) … Was Steve Garvey wearing a green Dodgers cap, or was it just the lighting? (From Steve Hom.) ”¦ One good thing about having Bryce Harper back off the DL: these stirrups. 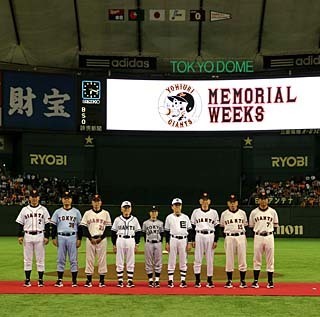 ”¦ The Yomiuri Giants’ first victory was on July 3, 1936, so they had a pregame ceremony on Thursday featuring all their previous uniforms (from Jeremy Brahm). Hockey News: Here’s a look at what appears to be an early Blue Jackets prototype (thanks, Phil). … Check out this shot of Canadian tennis player Eugenie Bouchard in a Canadiens jersey (thanks, Brinke). Soccer News: New kit for West Ham United. … Good interview with one of Puma’s typography designers (from Pete Woychick). … Soccer players usually switch jerseys at the end of the game. But Neymar did a jersey swap at halftime of yesterday’s Brazil/Colombia match, so he got a new jersey for the second half (screen shot by Jared Buccola). Grab Bag: Love the block-shadowed, vertically arched lettering on this vintage basketball jersey. ”¦ Texas Gov. Rick Perry has stopped wearing cowboy boots. … Fashion designer Vivienne Westwood has come up with new flight attendants’ uniforms for Virgin Atlantic (from Tommy Turner). … Roger Federer thinks Wimbledon’s all-white clothing rule is too strict. Further info here (thanks, Brinke). ”¦ And here’s a slideshow of past Wimbledon-in-white attire. … The Santa Barbara Fire Dept. wore camouflage for July 4th, presumably so the fire couldn’t see them (from Jack Martinez). ”¦ The CEV — that’s short for ConfÃ©dÃ©ration EuropÃ©enne de Volleyball — and Mizuno have introduced a new volleyball for the 2015 CEV Champions League (from Jeremy Brahm). … People posted all sorts of fun July 4th-related items on Facebook yesterday. My favorite, by a mile, was this one. 42 comments to Only 364 Days Until Next Yearâ€™s Stupid Caps! I thought that patch meant Fire Collins. Wasn’t SWEETNESS tossing out the first pitch in ’86? Only 364 Days Until Next Year’s Stupid Caps! Thats a damn lie and you know it, memorial day next year is less than 364 days away. Aren’t all the teams wearing stupid caps for the All-Star game festivities as well?? If so, then it’s only about a week away from the next set of stupid caps. I was going to say that as well, especially the home run derby hats, yea there’s 2 sets of hats they will wear next week. MLB is getting wayyyy too greedy. As I mentioned in the comments for that game which may have been missed, Ichiro was also seen in the earlier game with no patch and later had one. During one at bat with the patch, he was constantly patting the patch as if to try to keep it on. Just speculation, but I bet his unique left-handed swing kept causing the patch to fall off…wonder if video exists of it happening during an at bat. The Yankees probably wore the Lou Gehrig patch at home last Wed. so they could wear it with the pinstripe jersey and then sell them, along with yesterday’s road jerseys, through partner Steiner Sports as a “special” jersey. It is kind of like printing money isn’t it? In the past, teams were cheap, often sending jerseys to the minors to be recycled. Now, for the better players anyway, jerseys can be a source of profit. Wear it and sell it for more than it cost the team. Steve Garvey’s green cap is worn on a St Patrick’s Day during Vero Beach Spring Training. I used to live in Vero and this was an annual tradition for the team under the O’Malley Family ownership. I too noticed this “Boston” jersey tee. Do the Celtics have something cooking on this? After all, we are expecting gray uniforms this year as well. It features a printed team name on the front, Marcus Smart’s name on the back and his number on both sides. In regard to the Blue Jays wearing their Canada Day hats on the 4th of July, I can’t help but feel MLB is just lazy. For years they’ve never clued into it’s a bit strange to have the Blue Jays celebrate a US holiday while playing in Toronto, maybe they finally clued in a bit, gave it all of 5 minutes of thought, and came up with the brain wave of getting the Blue Jays wear their Canada Day hats on July 4th while playing a game in the US, which seems equally insensitive to having them celebrate Memorial Day in Toronto. It just strikes me as they don’t want to put any real thought on striking the right balance. I think the Blue Jays should have just worn their normal caps, just like opposing teams do on Canada Day. I never took that as disrespectful. I agree with you, I do think the Maple Leaf caps on the 4th were a bit much, and don’t reflect the Canadian virtue of “quite, polite pride”. Besides that really isn’t “our” Maple Leaf, just a stylized version for Jays’ marketing. Technically, it’ll be a full year, or 365 days. Though, at this point, maybe 364 days and 20 hours or so. Kevin, I explained why I think the caps are stupid. Could you please explain why you think today’s article is stupid? I think the headline is stupid, not only does it sound immature, but its not true as there are various times, including next week when mlb teams will be wearing hats that can be deemed stupid (HR Derby hats on one night then the front paneled ones on the all star game) PLUS the camouflage hats. Hey just be happy today’s main article is about actual uniforms unlike a few days ago lol. I didn’t think the article was stupid at all. Quite accurate actually. These caps really are stupid and I simply don’t see the point of them. Only 364 days until another stupid article? I give it less than a month. That guy in the Native American attire is a special-needs man that has been at every Braves game (yes, in that same outfit) since 1992. He’s in his 40s but has the mindset of a 10-year-old child. Good on you, Mets broadcaster, for pointing him out and making fun of him for his passion fur the team he loves. Is the outfit racist? Maybe.. but if you ever get to see this guy root for his Braves, you’d know he has no intentions of racism or hatred in his heart. We should all be so lucky to be able to have that sort of team spirit in an all-too-serious time. Could you please explain how Gary Cohen was “making fun of him”? I’d also be interested in hearing why you think it’s OK for a 10-year-old child (or someone with the mind of same) to wear an outfit that you yourself say may be inappropriate. If you’ve been following the site for any length of time, then you already know that ’Skins Watch is a catch-all category for issues relating to Native American imagery in sports. I chose the name because the ’Skins were (and still are) the highest-profile example of that issue, and the one that’s most frequently in the news. And if you haven’t been following the site, well, now you know. Not sure if they were the only AL team to do so, but the Tampa Bay Rays wore the blue caps last night instead of red. Why? Also, Brad Ausmus had the Lou Gehrig patch on his undershirt last night during the press conference. When the 7/4 caps were unveiled, the Rays’ design was shown in navy, not red, and I recall someone saying it was because they knew they planned to wear their navy alternate jerseys on 7/4. In other words, the Rays saw the problem coming and sidestepped it. Not sure why other A.L. teams couldn’t/didn’t do the same. the rays are a very impressive organization. Really surprised to see Terry Francona wearing that feather hat. Yes, they got rid of the navy “Twins” jersey. But the navy “Minnesota” jersey is specifically listed in the style guide as a road alternate — not for home use. The only home alternate, supposedly, is the cream throwback. But I guess they’re taking some liberties with the protocol. Yeah, they have been doing it all season. It drives my buddy and I crazy. We are no fans of the off colored navy alts anyway, but especially of them wearing the road jersey at home. By the way, what really bugs me about those “Navy” alts is that the navy isn’t as dark as the navy blue of the caps and simply doesn’t match. These navy tops were born in the 90’s while the Twins played indoors at the Metrodome. My question is, was this lighter “navy” chosen because of how it looked under the teflon ceiling of the Dome? Meaning, maybe it looked correct then, but now obviously looks wrong outside? I’m probably over thinking it. It could simply be a different shade due to different manufacturer. I read somewhere once that the actual shade of the Twins hat is called midnight navy or something like that. Also read once that the cool base jerseys don’t always come in all colors so sometimes they don’t match. Sometimes this was noticeable on road grays. Jersey wouldn’t match pants. I don’t know could be lighting too though. That Worcester hoops jersey is a beauty. When someone is pointed out on regional television, it’s typically in jest. I’m in Atlanta, GA so I didn’t watch the Mets broadcast, but I’ve seen plenty of games in which the broadcasters point out fans and it’s rarely in any manner besides one of poking-fun. And in response to your question of why I think it’s ok, I just think when our team is called the Braves and the man is special and just trying to support his team, there is a no harm, no foul mindset. My great grandfather was full-blooded Cherokee and nobody in my family, myself included, are offended by the Redskins name nor any other native American team names. Personally, I have always thought it was a tribute to Native Americans, in the sense that it keeps alive the history of the teams and, therefore, the people that those teams originally intended to represent. However, I also feel that everyone is entitled to an opinion, even if it’s not something I agree with. In a nutshell, I just think it’s a situational thing where a man that’s mentally challenged should be able to innocently represent his favorite team without being spotlighted by the media. Then again, I have met and talked to the guy, so I know the background. I’m sure if you didn’t know he was special, you’d think he was just being a racially insensitive, backwards thinking prick. When someone is pointed out on regional television, it’s typically in jest. In other words, you ignored the direct quotation I provided and substituted your own predetermined narrative. I just think when our team is called the Braves and the man is special and just trying to support his team, there is a no harm, no foul mindset. I didn’t ask about his mindset. You said he’s a functional 10-year-old — taking you at your word, I ask again: Why is it OK for a 10-year-old to dress inappropriately? Does he not have a guardian, a caretaker, or someone else to explain to him what’s inappropriate, just as one would do with an actual 10-year-old? If he engaged in lots of other objectionable behavior, would that also be OK? I’m not addressing his personal culpability; I’m addressing the the point that *someone* is personally responsible for him. I’m addressing the act, not the actor. I understand your apparent fondness for the fellow. But I think you’re letting that fondness get in the way of engaging with the actual issue. When is MLB going to get a clue that non-red/navy blue teams look ridiculous in these things. The same now applies for the all-star caps intro’d for this season. What’s in store for Cincinnati next year? All about marketing $$. ebbets field is selling the USA cap from the 1956 Olympics. I knew they had worn them quite a bit this year, but never really figured out the Hughes-Nolasco connection. I cannot recall the last time the Dodgers wore their script LA road jersey. Have they made the script LA their alts now? Are they on the way out? Packers wearing white at home is definitely heretical. Green (occasionally navy) and gold all the way. You’re ‘very upset’? Because the section’s title uses the most well-known example and the section’s content discusses the issue generally? Is ‘very upset’ worse than ‘offended’?